With colorful costumes, rousing rhythms, and complex choreography, BYU’s Living Legends has been dazzling campus, and the world, for more than 40 years. 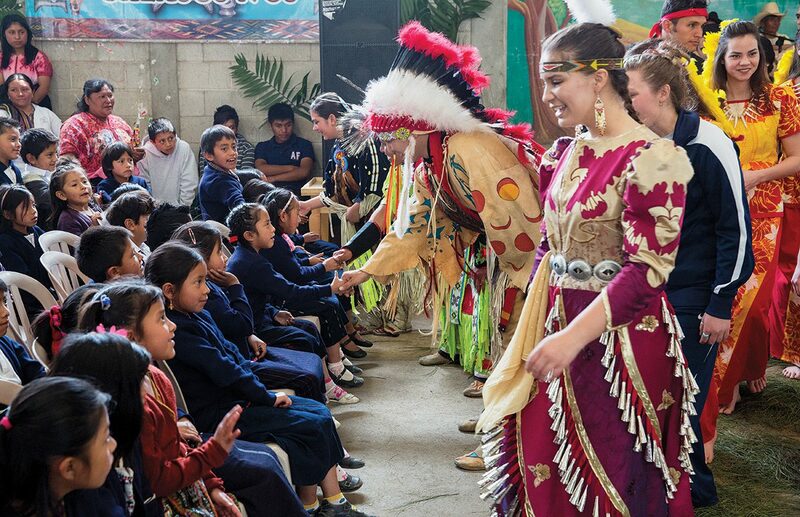 Here, the performers greet children in the village of Nahualá, Guatemala, during their spring 2013 Central America tour. At this particular performance, the 36 BYU dancers weren’t the only ones to grace the stage—the locals also performed some of their traditional dances and even sang a song in K’iche’, their native Mayan language. Tiana K. Cole (’16) (foreground), a Mohawk descendant and Living Legends veteran, loved sharing her culture with the Guatemalans and learning about theirs. “I think it just tells a more believable story if you’re telling your own,” she says.